If you are a NERF nerd like me, today was a very special day! I got to test out the yet to be released NERF Accustrike darts and two new blasters - the FalconFire and AlphaHawk. 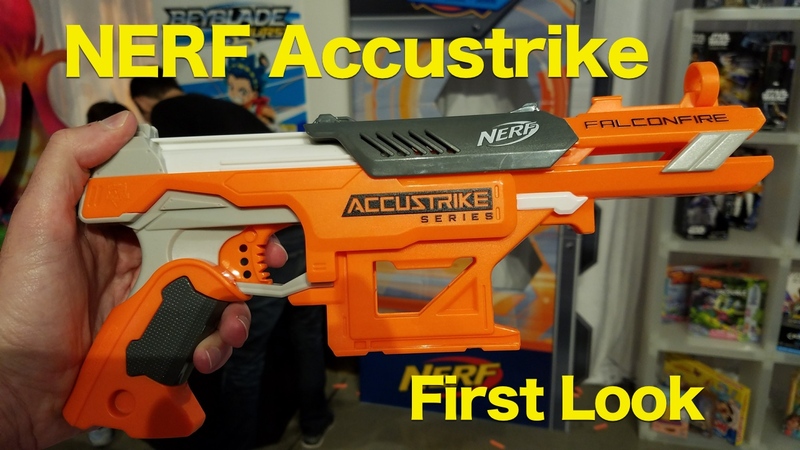 As they showed in the video, there is one major trade off with the new Accustrike darts - less range. If you are looking to reach distances of 50 feet or more, you will still want to go with the Elite darts. The Accustrike Darts work best at closer range. So, unfortunately, if you were hoping to have sniper like accuracy from 60 feet out, that is not going to happen. The Nerf N-Strike Elite Accustrike Alphahawk blaster will sell for about $30 when it is released in 2017. It features a rotating drum that holds 5 darts (it will come with 10 darts) and a stock to steady your shot. The Nerf N-Stike Elite Accustrike Falconfire will sell for $15 when released in 2017. This is just a single shot blaster, but it does have storage for 2 additional darts. Nothing too fancy about this one, it does have a sight and with the Accustrike darts, is plenty accurate. This was the best news we heard all day! You don't have to run out and get new blasters, you just get new darts to have better accuracy. All the fun does not start until 2017, so we will keep you update as soon as we can do more testing.